Our partners never fail to amaze us with participation in sporting events. Today we are going to cast light on Neomatica’s success in Russian Ultralight Aviation Sports Championship. This summer “Pervushino” airfield, situated 40 km from Ufa, united air-sports amateurs and professionals eager to watch the plains, ultralight trikes and gyroplanes taking-off and sailing through the sky. To succeed in such competitions the pilots shall possess high accuracy, which is hard to assess without special equipment. It has been Neomatica that came up with the solution, offering the event administration to use ADM terminals connected to Wialon system. As many as 20 terminals were connected in the shortest time possible despite the heat of 40 °C. Yet the severe weather conditions didn’t affect system operation, allowing to obtain relevant data for competitors evaluation. In accordance with the extensive competition program the flights were performed at daytime, while the referees had to work the night shift analyzing the accuracy of their flights. During breaks the participants were granted access to Wialon system to survey the results and analyze their mistakes for further corrective actions. Wialon proved to be the ultimate solution for pilot performance quality evaluation. 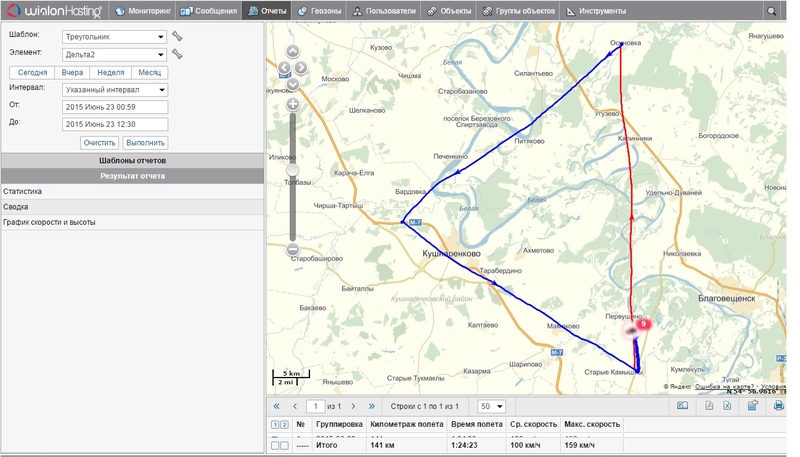 Geofences tool, for instance, allowed to assess the results of “Marten” or “Kunitsa” exercise. Pilots were required to pass the control points, marked on the map, and in certain sectors exhibit maximum and minimum speed, defined by the participants themselves. As for “100 minutes” exercise, the pilots were required to capture the maximum number of control points indicated on the map. Countdown for route planning and point capturing started after the paper maps were submitted to the pilots. This exercise is designed to assess points capturing accuracy and time limits compliance, as for every extra second the participants were punished with penalty points. Follow-up of the competition results was conducted on the basis of reports on passing the geofences over specified time intervals. The event hasn’t been without emergency situations. While performing another exercise, the pilots were required to maneuver the largest triangle possible. The complexity is determined by limited fuel supply and strict time constraints. One of the pilots underestimated the “distance to empty” and landed far from the airfield. Only the tracking system installed prompted fast reaction of control service specialists providing the necessary assistance, due to communication devices ban for the time of competitions. The administration remained pleased with the highest level of the event and awarded Neomatica for providing excellent technical assistance and objective control on a high international level. The system reliability has been confirmed by several pilots showing willingness to acquire AMD terminals with Wialon software in private hands. Wialon is successful in conquering the airs, being just as good on the ground. Can-Am Trophy participants connected their vehicles to Wialon to hit the roads of Russia. The competition is on the third stage, after the participants took on Udmurtia and Tatarstan. September 25-27 the Astrakhan Region is hosting the final stage of the competition. But that is yet another story to be told. Follow us on blog and be on top!